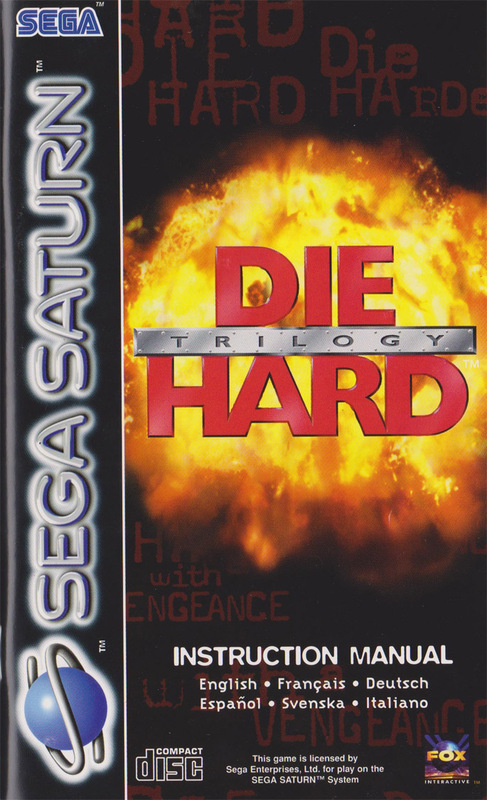 Die Hard Trilogy for the Saturn is a shining example of a multiplatform title that does not work on the Saturn. The Saturn was notoriously difficult to develop for, with its complex CPU structure, lack of transparencies and bizarre way of drawing polygons and you can really tell that Probe Entertainment had a hard time getting this game to work on the Saturn. 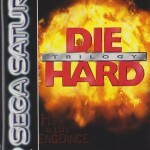 Die Hard Trilogy is a compilation title of three games based on each of the first three Die Hard films. 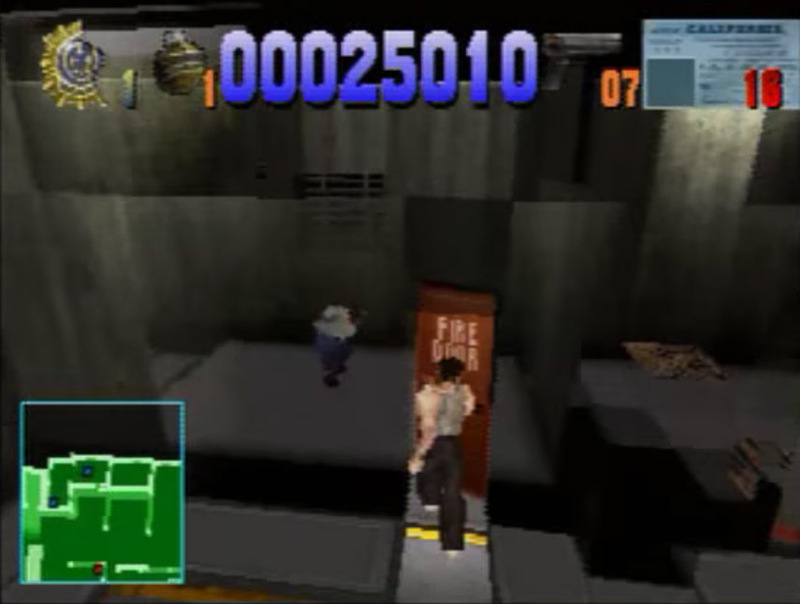 The first Die Hard is represented by a third person action shooter where you must kill a certain amount of terrorists before going up another floor in the Nakatomi Plaza before it explodes. 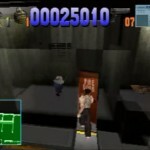 It’s a serviceable piece of arcade fun that also sees you collecting power ups and freeing hostages. 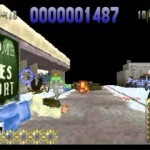 Die Harder is an on rails shooter that sees you taking on waves of terrorists who have taken over Dulles Airport. 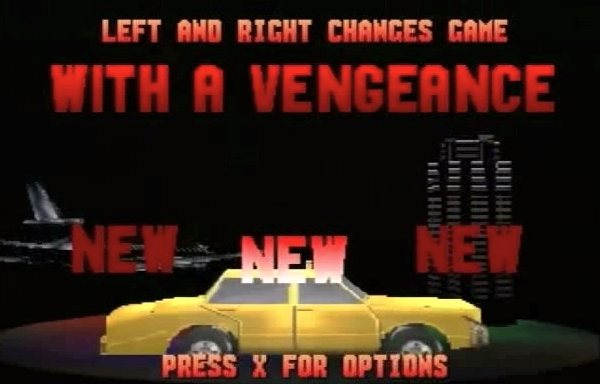 You also have to avoid shooting civilians and there are also plenty of extra weapons and power-ups to find. 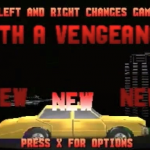 Die Hard with a Vengeance takes a completely different approach and is actually a time attack driving game in the Crazy Taxi mould. You have to reach each bomb and destroy it within a certain time limit. Some bombs take the form of bomb cars which must be chased down and shunted until they detonate. Each of the three games is presented as visceral, no-nonsense thrill-rides with an incredible blasé attitude towards civilian casualties. There’s a copious amount of gore and a personal highlight takes the form of the use of windscreen-wipers to wipe the blood of the screen when you hit pedestrians. Thanks to the decision to draw characters as simple human bodies with cardboard cut-out faces, it’s also a surprisingly humorous game even if that wasn’t the intention. It’s a shame then that Probe Entertainment hasn’t optimised the game to run even half as fast as its Playstation brethren. 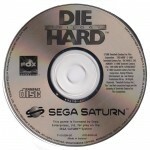 Die Hard Trilogy on Saturn is an absolute chore to play. The game chugs along at sub-20fps for most of the time and it loses all its bombast and vibrancy in the process. Each stage takes twice as long to complete in comparison to the Playstation version and it’s also uglier to look at thanks to all the transparent surfaces being replaces with a stippling effect. Ports like this showcase exactly why the Saturn had such a hard time competing with the Playstation. 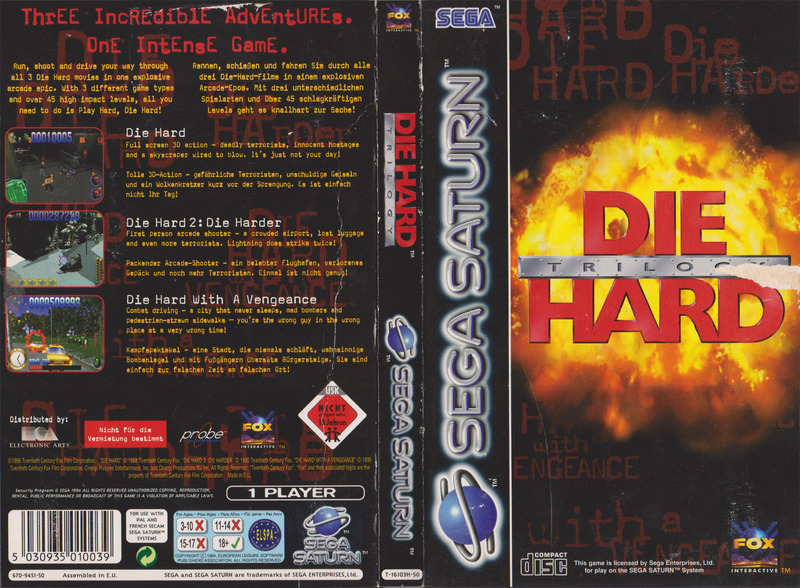 It’s not all doom and gloom though; the original Die Hard definitely comes off the best and is the most playable of the games featured. It was never the highlight of the compilation to begin with, but it’s a serviceable pick-up-and-play action game that rewards a good player. 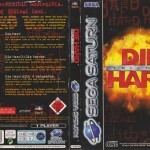 Die Harder suffers the worst as the sheer amount of destruction, character models and particle effects really test the Saturn in ways it wasn’t supposed to be tested. 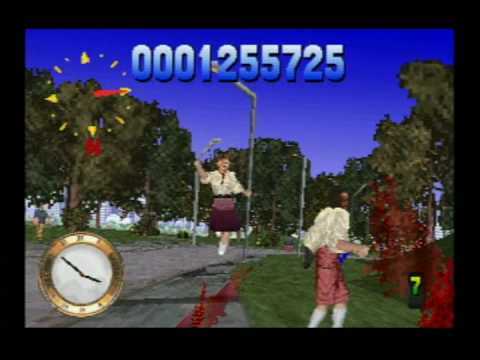 This is the biggest casualty of the compilation as in its original Playstation incarnation this was the highlight of the trilogy. Die Hard with a Vengeance suffers in a similar way to Die Harder with copious amounts of slow-down present and a control scheme that feels like its fighting against you the entire time. 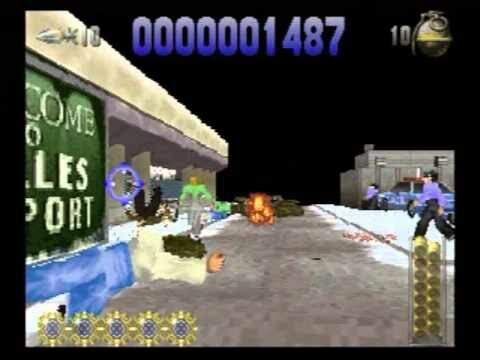 Chasing those bomb cars has never been so infuriating. 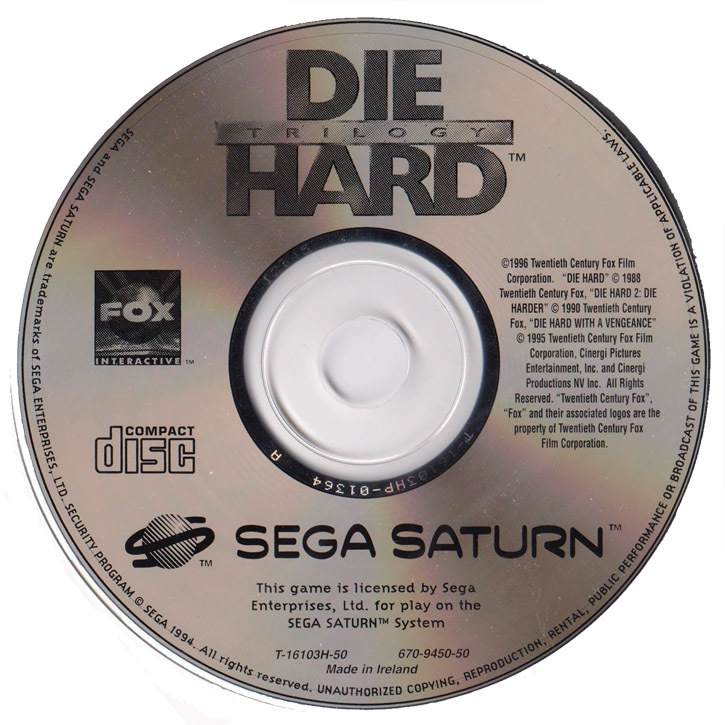 The Saturn version of Die Hard Trilogy is not the way to play this game. Probe Entertainment has clearly struggled to get such an action-heavy and incredibly detailed game onto the Saturn and the results are mediocre at best. 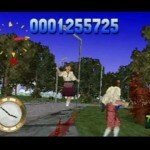 Flashy, arcade style action should be the Saturn’s forte as SEGA consoles are essentially built on this foundation, but once again the console’s architecture lets it down.